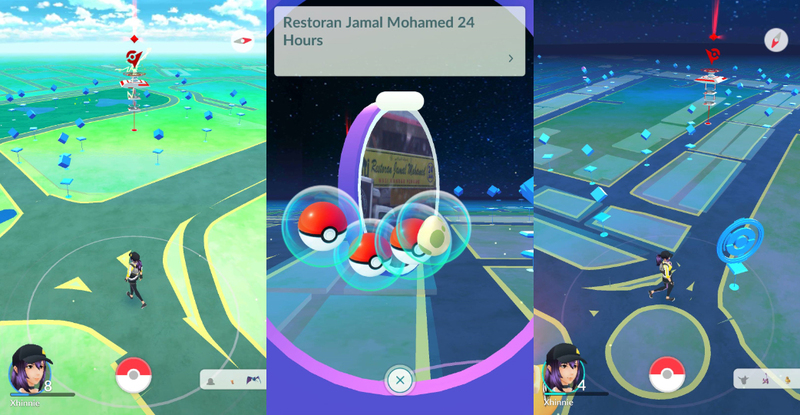 14 Must-Know Tips For All M'sian Pokémon Trainers On The GO! The Ultimate 14 Must-Know Tips For All M'sian Pokémon Trainers On The GO! To say that Pokémon GO took Malaysia by a storm is an understatement, it was more of a tsunami phenomenon. Everywhere you go now, you’ll be able to meet fellow trainers on the prowl who claim they want to be the very best and catch whatever Pokémon is in sight. Some may be experts already and know the ins-and-outs of how to be an excellent trainer whilst others may still be grasping the purpose of PokéCoins. 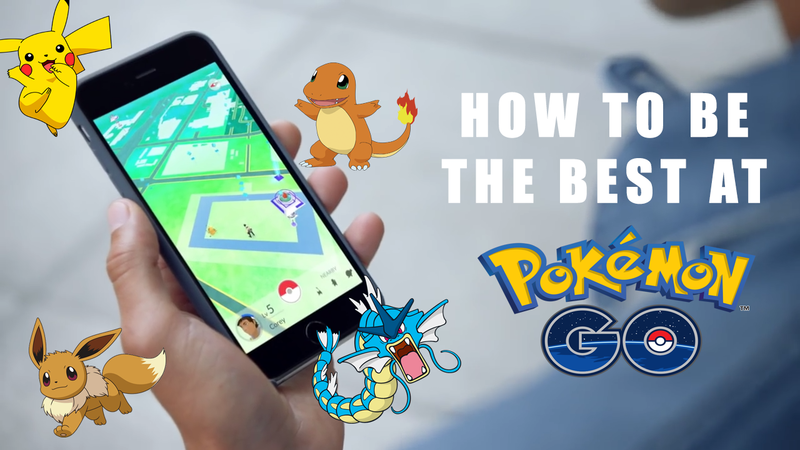 This Pokéguide will be your best friend as we go through what the important facts that you should have on hand when playing Pokémon GO. Besides going Pokemon hunting, the next thing you should be looking out for are PokéStops. If you happen to see a few nearby your current location, stick around and replenish your supplies of Poké Balls and other goodies. A PokéStop changes its colour from blue to purple once you have interacted with it and after 5 minutes or so (timing can vary), it will return back to blue where you can once again stock up on your necessary items. TIP: You also get 50 XP per spin of each PokéStop, which is useful if you’re surrounded by all these PokéStops but have no Pokémon are nearby. Even if your bag is full, you should still swipe it anyway. If you’re heading into the game assuming that levelling up your Pokémon is the same as you normally would in other titles, don’t get your hopes up. The levelling system in Pokémon Go works differently where instead of battling wild Pokemon in tall grass, each Pokémon you catch will come with a few of the Pokémon’s candy as well as Stardust. Both of these items will be essential when it comes to ‘training’ your Pokémon, especially the candy because it’s needed for evolution. 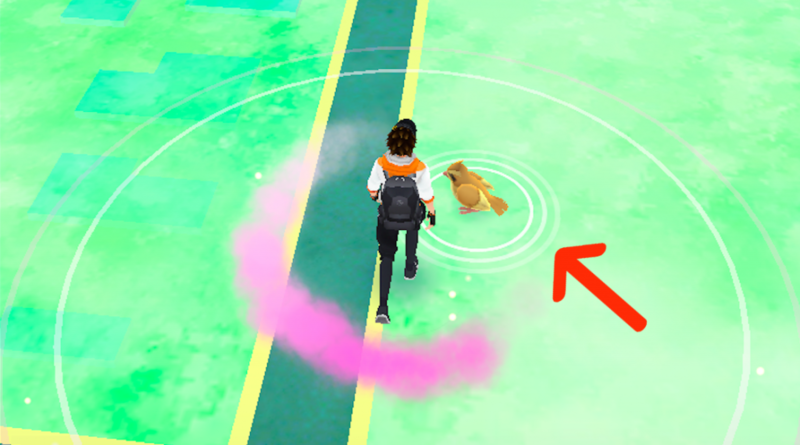 So if you’re feeling like all you’re seeing are Rattatas or Pidgeys, don’t ignore them—just catch them all. 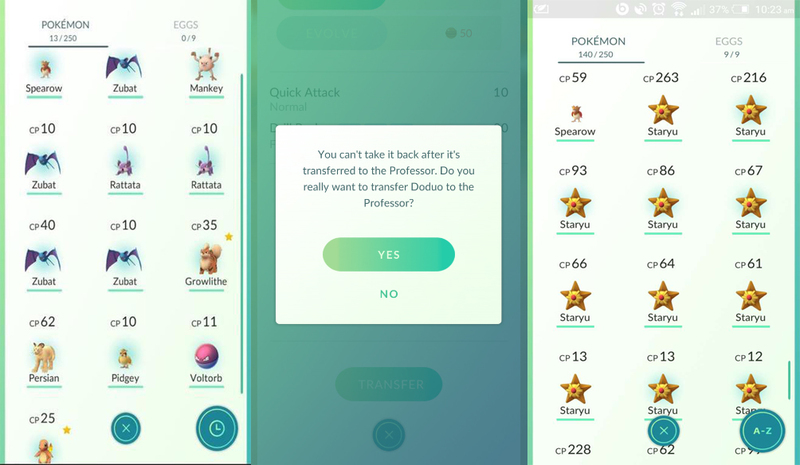 You can then transfer your duplicates to the Professor in exchange for candy, which will then further help you progress by not only leveling up your avatar but your Pokémon as well. TIP: If you caught a duplicate Pokémon with a lower CP, you can directly transfer it before putting it into your inventory. If you’re wondering what those tiny animations of leaves rustling about are, you should not waste anymore time wandering elsewhere and head straight there because high chances are there’s a Pokémon within. Besides checking for those leaves, another key sign you should be aware of are pink flower petals as those indicate PokéStops with active lures. Pokémon will gather over there and be a great stop for you to catch some. 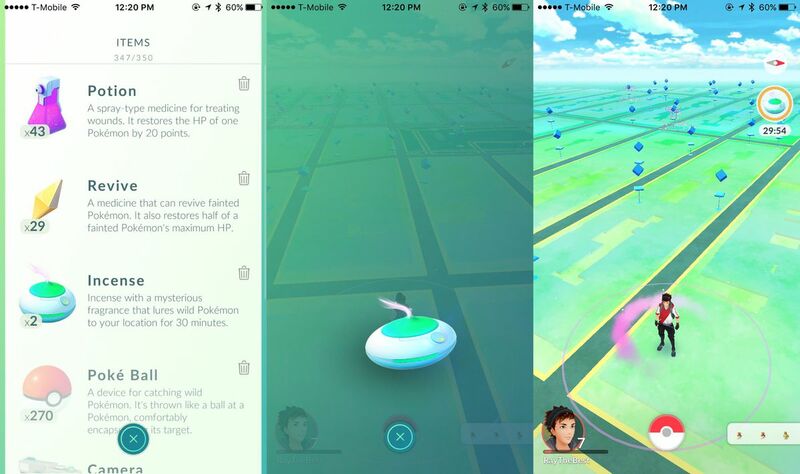 TIP: Lure Modules only work at PokéStops and they are available for everyone but if you’re feeling a little selfish, you can use Incense. That will only work for you and no one else, so the Pokémon will be attracted to only you. So if you’re wondering what to do with your extensive number of Eggs stored in your inventory, use your incubator and incubate one. There’s 3 sets of distances you need to travel in order for them to hatch which are 2KM, 5KM and 10KM. Before you grab those car keys, it’s not just the distance that matters. Pokémon GO uses both your pedometer and the GPS of your mobile to calculate how far you’ve actually walked. If you travel over 12mph (roughly 20 km/h), it limits the distance you’ve traveled, so make sure to not go at a high speed. If you have a skateboard or bicycle, now would be the best time to make use of them as long as you don’t go too fast. Also, make sure your app is active and open. You must be logged in and playing for it to count your steps. TIPS: Make sure to walk in a straight line because the game checks in and measures your travel distance periodically by looking at your displacement from the previous check point. So walking around the same block over and over won’t net you very much distance because you’re never that far from the last check point. You can also get extra incubators from Pokéstops, but unlike the first one already in your bag, these can only be used for a limited number of times. The 10KM Eggs are known to have rarer Pokémon within, but that’s still no guarantee. We commiserate if you get a Rattata out of the 10KM Egg you painstaking hatched. Remember that you can incubate more than one Egg at a time, as long as you have enough Incubators. 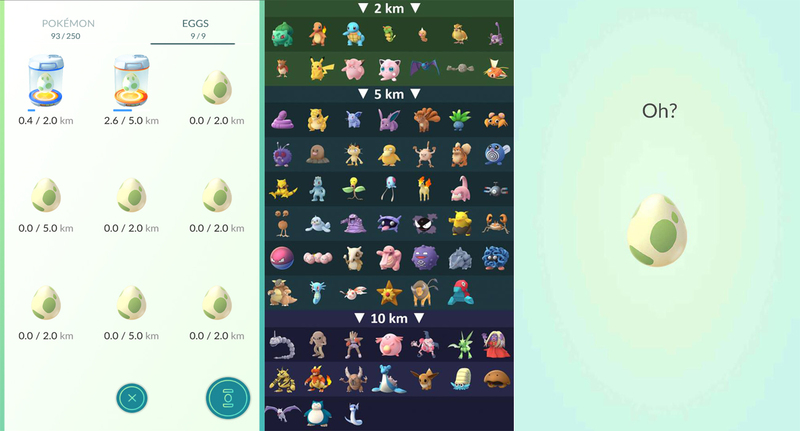 Save time and walking steps by placing the Eggs in all available Incubators. I understand that one of the best parts about Pokémon are the evolutions, but before you get so excited and quickly evolve your roster at every chance you get, pause and evaluate the stats of your Pokémon first. 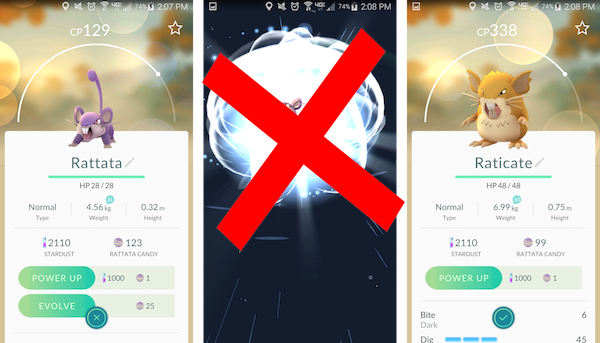 If you notice the half circle bar above your Pokémon when you open its main menu, that is its level bar and the closer it is to the end, the best time that is to evolve it as you will be able to get higher CP if you do so. Throwing your Poké Balls may seem simple but there are actually strategies that can help this hit-or-miss process become more beneficial. If you hold down the Poké Ball for a second before throwing, you’ll see a little coloured circle appear within the target. Toss the Ball when the ring is the smallest for the best chance of a capture. It’s important to note that the colour of a circle is important too. Green means an easy capture, yellow is less so and red means you might have to use items such as Razz Berries to make sure that the Pokémon doesn’t run away. How you throw has its rewards too. A “Nice!” toss happens when you get it inside the coloured circle while it’s fairly large, and will grant you an additional 10 XP if you make the catch. A “Great!” toss happens when the coloured circle is about half the size of the white circle, and will grant you an additional 50 XP. An “Excellent!” toss happens when the coloured circle is very small, and will grant you an additional 100 XP. You can even throw curveballs by giving the ball a shake first before tossing, which rewards you with style points for nailing that throw. Helpful advice would be pulling the Poké Ball either to your left or right of the screen first. If you pulled to the left, spin it anti-clockwise. If you pulled to the right, spin it clockwise. Don’t spin it too much because doing so will result in you missing. Then, toss to the middle of the screen. TIP: Another tip for throwing Poké Balls at tricky creatures: they are easiest to catch just after they try to resist (you know, like when they lunge at you, or swat the ball away) . So hold your finger on the ball until they make their move, and THEN throw it. When you’ve reached level 5, you’re finally able to visit Pokémon Gyms and battle against other trainers. If you visit a Gym with your team’s colour or take over one of the opposite, you can store your Pokémon there and become a Gym Defender. Afterwards, check your Shop tab and click on the shield icon to access your Defender Bonus for free PokéCoins and Stardust. Should your Pokémon not be dethroned, you can check back every 20 hours or so to receive more (The amount varies depending on how many Pokemon you have in the Gym along with their CP). When leaving your Pokémon to defend a Gym, it’s best to go with your second or third best instead of your first. If your focus is on increasing your trainer level instead of earning coins, don’t spend too much time defending the gyms you take over. 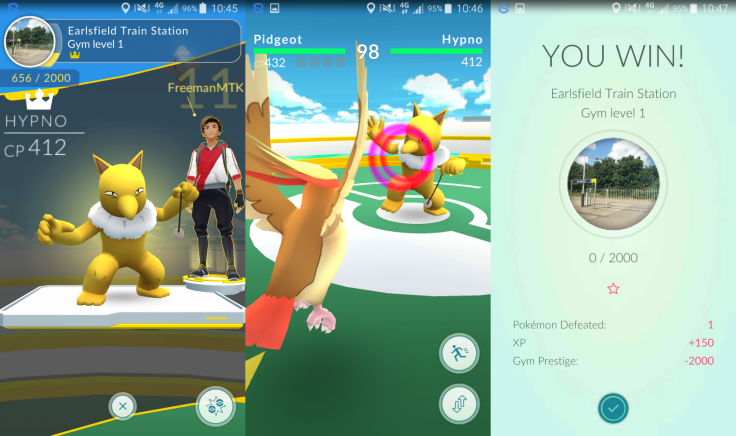 You earn five times as much XP for defeating and taking a gym than you do for training at one of your own to bolster its defenses. It’s best to focus on your own trainer level first before worrying about holding gyms for your team. TIP: For each Pokémon you put in a Gym, you can redeem 10 coins per Pokémon so if you want more PokéCoins, place more Pokémon that have high CP. 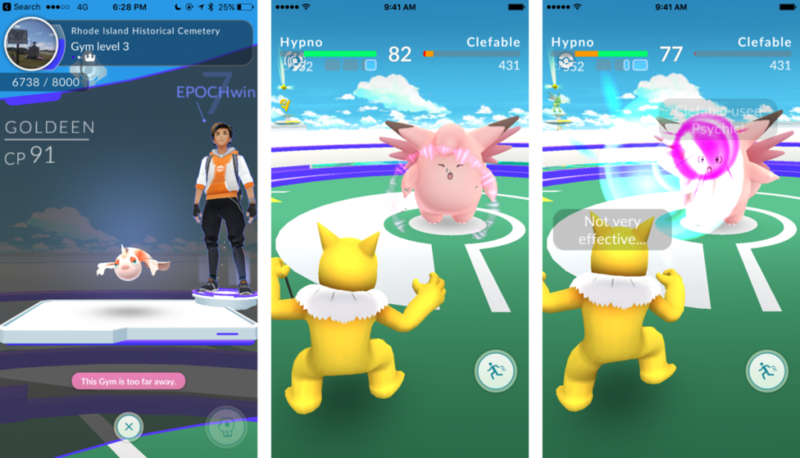 Unlike other Pokémon games in the past, Gym Battles in Pokémon GO do not rely on a turn based system. To attack, you simply tap the screen and your Pokémon will deal its first attack as soon as it’s able. You can even deal a special attack by holding down on the screen and releasing, but you will need to charge the meter below a Pokémon’s health until the bar is full (Do take note that different special attacks have different meters). TIP: When the fight starts, wait for the screen to flash yellow. When it does, swipe right or left and you’ll dodge their attack. This flash is present throughout the entire match, so you can follow the same pattern of flash, dodge, attack until the battle is over. Not every ability is dodgeable, like “Earthquake,” but most are. Defending Pokémon attack every 1.5 seconds, so keep that in mind as you plan your dodge and attack pattern. Don’t try to attack too much after each dodge. 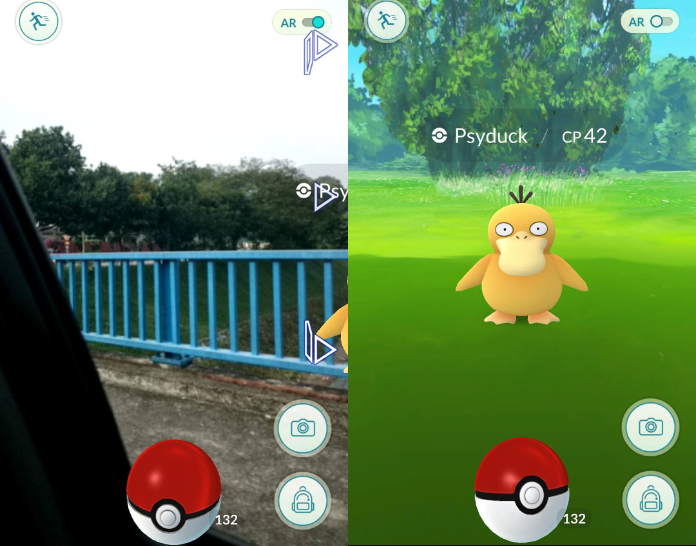 One of the highlights of Pokémon GO is being able to see Pokémon in your real-world surroundings (as seen on social media everywhere). However, needing to locate the Pokémon around you and keeping it in the frame can be challenging, especially if you’re sitting in a car and have to twist around like an idiot. The best way to fix this is by turning your AR mode off. Yes, you heard me, turn it off. Although you lose the cool effect of having the Pokémon jumping about your bedroom, the benefit in return is that the Pokémon will be centered on your screen and not move when the phone does—making it easier for you to throw your Poké Balls. You can always switch back between modes whenever you desire which is handy and it also helps to save your battery as well. If you manage to gather some Great Balls or any other enhanced Poké Balls, don’t be too fast to use them on rare Pokémon that you’re only catching to do battle. Remember that catching a rare Pokémon usually equals to having a harder time collecting candy for it. If you can’t get enough candy, evolving that Pokémon will be impossible and that means limited power and less efficiency in Gym battles. Bumping into an evolved Pokémon is always exciting, but think twice before attempting to catch it. The general rule of thumb here is that it’s always much easier to catch a common Pokémon and evolve it rather than a rare one so use your Poké Balls wisely. 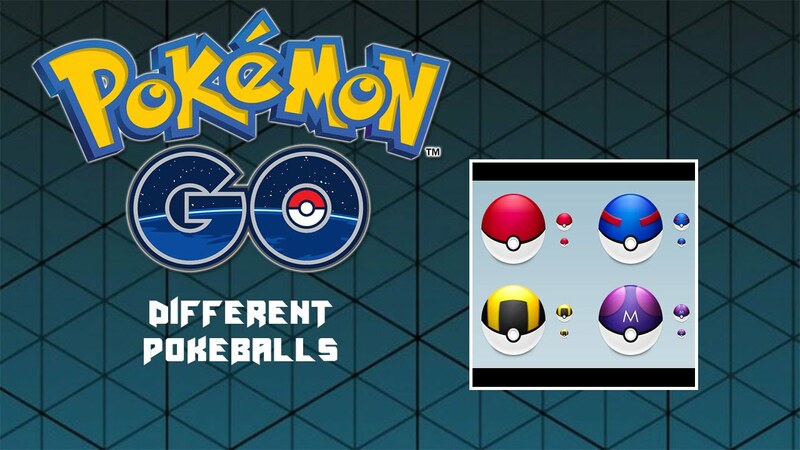 Don’t waste your more powerful Poké Balls at one Pokémon—try to catch it with normal Pokéballs instead. TIP: Use Razz Berries for Pokémon with a target ring coloured orange or red as those are the difficult ones to catch. A little fun fact for you if you were wondering what the tiny rings surrounding a wild Pokémon were. If the rings are white, the Pokémon was most likely there naturally. If the rings are a hue of purple and pink, it most likely showed up because of a nearby Lure Module. If the rings are replaced by a pink cloud, that means it was attracted to your Incense item and the best part, only you can see it. By taking note of these different rings, it will help you develop a proper feel of finding more Pokémon in your area. Plus, it’s a nice bonus for when you’re playing with your friends. Before you use your Incense or evolve any Pokémon, it’s better to do those while also activating a Lucky Egg. Lucky Eggs double your XP gain which is best for you to level up your Trainer level fast. So catch a lot of Pokémon, build up your stash of candies, then activate a Lucky Egg and evolve them all. You will receive 1000 XP for every evolution instead of the standard 500 XP. However, be sure to do the math and not waste your time on those that aren’t worth it. For example, evolving four Pidgeys into Pidgeottos will cost you 48 candies and net you 4000 XP with a Lucky Egg activated, but just one Pidgeot will cost you 50 candies and only get you 1000 XP with a Lucky Egg. So it’s not as rewarding as it may seem. Also, as with other games in the franchise, your Pokémon health bar will regenerate after an evolution, so wear out your Pokémon at Gyms if needed. 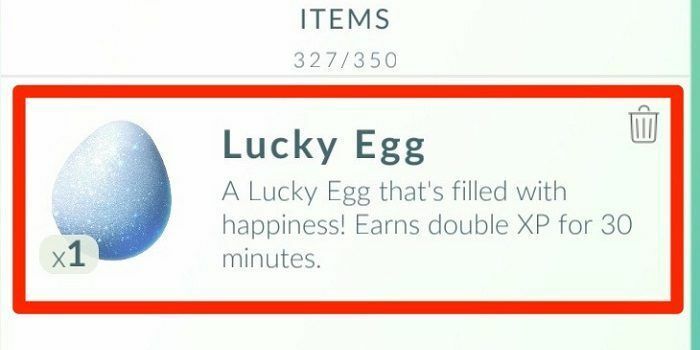 TIP: If you’re close to reaching a new level, don’t use a Lucky Egg to boost your own level just yet. Only use it when you’ve actually reached a new level to get even better Pokémon. 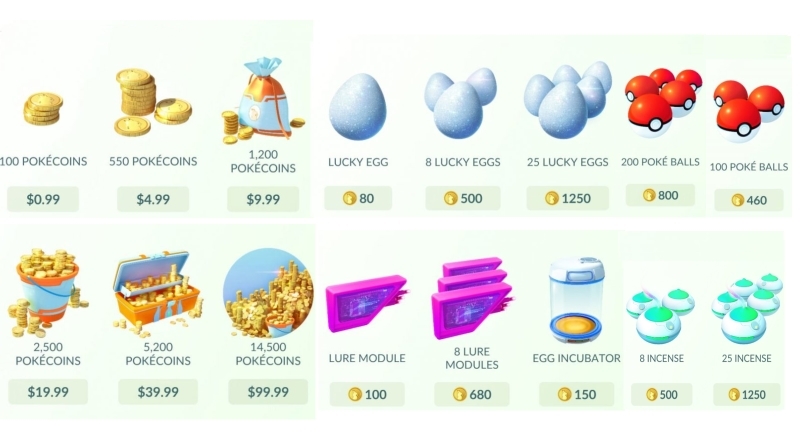 PokéCoins are the in-game currency you can use to spend on items available in the shop and seeing as they are very limited for those ‘Free2Play’ trainers, don’t waste them on items you can already gather from PokéStops. The key items you should be spending on are Lure Modules to attract more Pokémon to you and Incubators so that you can hatch multiple eggs at once. Holding gyms is how you earn PokéCoins to spend in the Shop (10 per gym held), and you can earn a maximum of 100 PokéCoins every 24 hours (or 10 different gyms). TIP: Every time you level up, you receive certain items for free. Here’s a comprehensive list from TheSilphRoad reddit that breaks down every known item reward tier so you’re not spending PokéCoins on something you’re about to receive for free. For this trick to work, it’s best to get out and find an area that’s quite barren. 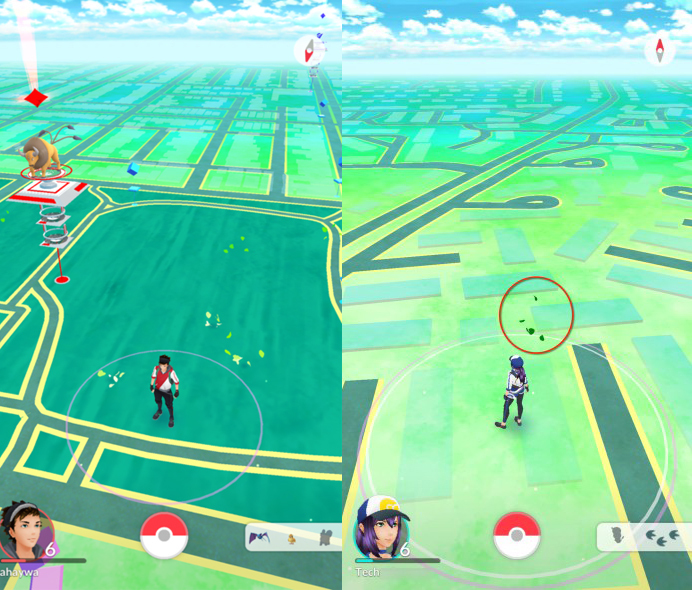 You need to ensure your ‘Nearby’ list is completely clear (You can restart the game to refresh it). Once you have found that location, you can use your Incense and if done correctly, you should be able to see rarer Pokémon spawn. There have been people who had the luck of finding Abras, Ponytas, Charmanders and even Blastoise show up. This trick seems to work because having nothing nearby for the Incense to pull from, it just grabs a random Pokémon to spawn near you. This greatly increases the odds of getting a rare Pokémon, rather than the Pidgey that is likely nearby.